These articles were published in the newspaper 'Keskisuomalainen' on December 6th, 2001. Published on these pages by the author's permission. Translation to English language: Lt(jg) Markku Herd, Finnish Navy. Originally published in the newspaper 'Keskisuomalainen' on December 6th, 2001. One day, back in the distant 50's, the restaurant table of a Jyväskylä merchant was approached by a penniless man. An ex-soldier who had suffered his punishment, stripped of honor after a closed-doors trial. Said person asked the occupant of the table, if he could join him. - The Commander is always welcome to my table, the recently passed-on Ture Mattila is said to have responded. Until his premature death almost three decades ago in 1964, the Knight of the Mannerheim Cross, a fighter ace with 56 victories, Lieutenant Colonel Eino Luukkanen worked in his ex-subject's family business and lived in a city apartment owned by Mattila. Mattila had also been a fighter pilot in the war, fighting successfully under the command of Luukkanen, the latest in the famed 34th Fighter Squadron. - Ture Mattila had very warm relationship with his former superior, Nyyssönen said. sanoi. - Mattila regretted the last stages of his commander's life and he sought for the redemption of his superior. Squadron Commander Eino Luukkanen (left .) 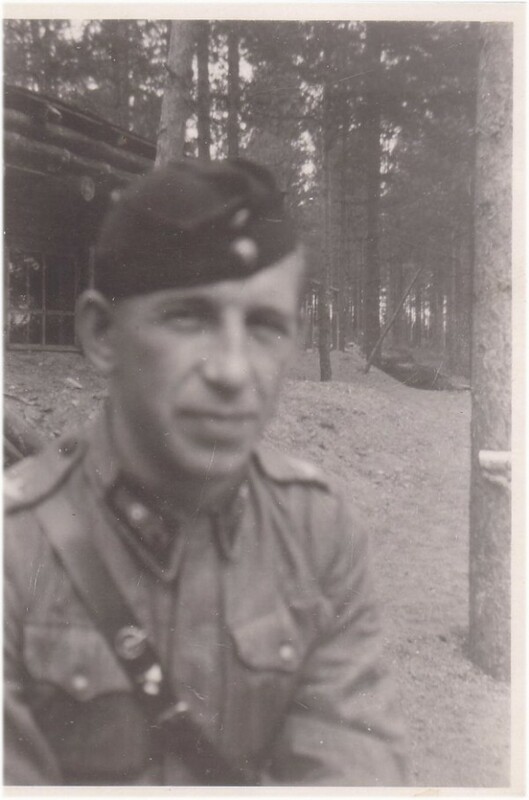 and oberleutnant H. Götz. The difficult time of Luukkanen's life rose to headlines again last year, when Juha Pohjonen's book of Finnish cases of treason was published. Luukkanen and one of his subjects was accused of handing Finnish air photo maps to the Swedes during the so-called great espionage case of Jyväskylä. Nyyssönen has perused the book thoroughly and agrees with the late Mattila. Luukkanen never admitted revealing any material to Sweden's Säpo (Secret police), but he said he had taken an Air Force plane over the western border to bring fruits and drinks to his pilots. At that time, Finland was still poor and everything was rationed. Nyyssönen says also that many of Air Force officers currently on duty agree, that the brilliant pilot knight who had done great services to the Fatherland must be rehabilitated. Getting stripped of honour must have been so hard a blow to Luukkanen, that it probably quickened his death. His heart failed in October 1964, but still before his death he worked in Mattila's company. - After his commander's death, Ture Mattila contacted his fellow pilots and arranged a collection. This stone was erected with those funds, Nyyssönen told. A ten year contract was made with the parish of the caretaking of the grave, but after that the resting site of the pilot knight fell on ill repair. A couple of years ago the guild of flight technics repaired the degraded stone. While we were at the grave, Nyyssönen cleaned the lower portion of the stone, where the number of Luukkanen's victories is said to be 51. According to current records, the real number is 56. 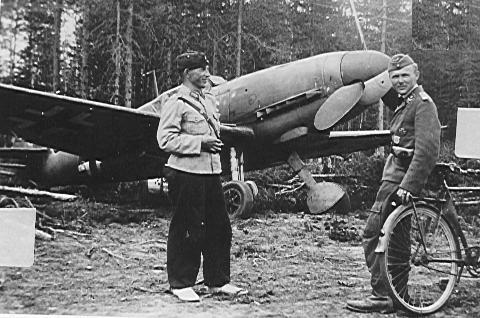 Luukkanen, who flew the greatest number of combat flights (441), was third in the victory list of Finnish aces right after Ilmari Juutilainen and Hans Wind. On Independence Days there are often candles on the lonely grave, but the place is not in proper care. - As far as I know, there's no designated caretaker, Nyyssönen said. - I have visited this grave with high-ranking officers. One thought aloud, whether the Air Force would take the grave as a traditional site. At least then someone would take care of this. But Eino Luukkanen is not forgotten. Using his name on the Internet search engine easily produces over 100 hits. Ilkka Nyyssönen wiped clean the pilot knight's tombstone in the Seppälä cemetery in Jyväskylä, two days before the Independence Day. The knight of the Mannerheim Cross, Lieutenant Colonel Eino Luukkanen, fighter pilot with 56 victories, died of heart attack at the age of 55 in 1964. Now his memorial stone in the Seppälä cemetary looks lonely and weathered, but he is not forgotten. - When I have brought the Independence day candle to the grave these years, there has already been light, tells executive manager Ilkka Nyyssönen. Nyyssönen is a civilian pilot. Luukkanen's fate was told to him by the late subject and comrade-in-arms Ture Mattila. Luukkanen was accused of revealing aviation maps to the Swedes and stripped of his honour. Luukkanen himself admitted bringing fruits and drinks from Sweden to poor, rationed Finland. Mattila thought that Luukkanen had to be redeemed, and Nyyssönen agrees. Luukkanen worked his final years in the trade business of his pilot friend. After his death Mattila arranged a collection, and the funds were used to erecting the gravestone. Now no one seems to be regularly taking care of the site. In Finland and around the world Luukkanen's reputation still lives. In the United States, there are still new prints coming out of his memoirs published in 1956. Because the large interest and questions shown at Eino Luukkanen here's some additional information: "Eikka" Luukkanen - The Youngest Squadron Leader - excellent article at Fighter Tactics Academy by Ossi Juntunen. Lt. Col. Luukkanen's military career was ended in Court-Martial, 1951. He was sentenced to lose his rank and office due to espionage. Luukkanen had in good faith handed over some aerial photographs to a man who turned out to be the agent of a foreign (NATO-affiliated) country. Later his right to pension was returned to him, however. He wrote his memoirs which were published in 1956 and were a minor success: three printings were taken. His book was translated in English and published in Britain in 1961 and reprinted in the US in 1992 (Alexandria, VA. Time) titled "Fighter over Finland". Luukkanen died in 1961- his career and health had been ruined, although he was never jailed. Luukkanen was survived by his widow and his son Risto, who also entered military career. Veterans have told two kind of stories and comments. Some say that anyone could have gone to a bookstore and bought those maps he gave to Swedes and that he was doing it only for his patriotism and fright of the USSR. Others have told that he was using fairly much alcohol those days and just did it to get money for his drinks. All of them naturally respect what he did in war time and even after that and maybe the real truth wont be revealed. It is kind of similar thing as if one tries to ask the veterans about war time kill claims and how they are exaggerated and how archives show smaller enemy losses.... That wont be a very long discussion. Camouflage: Luukkanen was definately a great fighter pilot and an exceptional leader. Penttiku: Luukkanen's treason case was about giving the Swedish SäPo old aerial photography maps of the former Finnish territory in Carelia, then (and still) occupied by soviets. The peace treaty dictated by the soviets forbid even ownership of such material from us. All such maps and material should have been either destroyed or handed to the soviets. Well, at least some good came from all this grief to Luukkanen. While he was serving his prison sentence, he had time to write his memoirs "Hävittäjälentäjänä kahdessa sodassa" ("Fighter pilot in two wars") that has been translated to english and published by Time-Life with the name "Fighter Over Finland". These articles were originally published in the newspaper 'Keskisuomalainen' on December 6th, 2001. Photos via Virtuaalilentäjät ry collection.